Sumptuous colour is a key feature of this striking design from the luxurious red Grand Prix roses, the dazzling pink gerbera and the cool violet of the orchid. This expertly arranged display makes an impressive and very stylish gift. 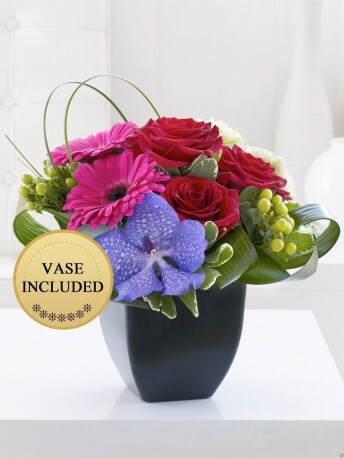 Featuring 3 aspidistra leaves, 2 green carnations, 2 green hypericum, 3 red Grand Prix roses, 2 cerise gerbera and a blue Vanda orchid with pittosporum and steel grass, presented in a neat curved black pot.